Vehicle owners in California must have a registered vehicle with the appropriate license plates. All rear plates must display a validation sticker that is up-to-date. Failure to do so leads to additional fees when renewing a vehicle. If you’re living or plan to live in California, you can register your vehicle with the California Department of Motor Vehicles (DMV). The DMV is the place to register, apply for license plates, and purchase validation stickers. Remember, California law states that you must have up-to-date license plates with a valid sticker displayed on the rear of your vehicle. 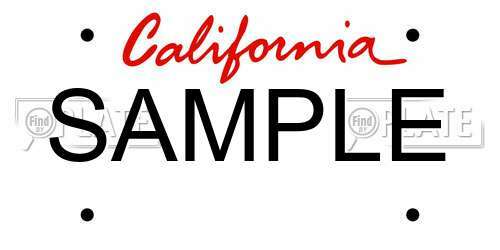 When you register your vehicle and apply for license plates, you can choose between the state’s standard california license plate or a specialty plate. Upon registration, you must show your license (not expired). When you receive your license plates, you are expected to place 1 on the front and 1 at the rear. If you are registering a motorcycle, you may only be required to display 1 license plate on the rear. In addition to registering your vehicle at the DMV, you must also purchase a validation stick to show the month of expiration. This sticker must be placed on the rear plate and be visible at all times. You will obtain both a month stick and a year sticker. The month sticker should never change and a new year sticker will be given to you upon renewal of your registration. It's not uncommon to see catchy slogans and phrases found on license plates in California. You can personalize your license plate using a combination of numbers, letters, and some special characters. Cannot look like an existing license plate (i.e. interchanging letters and numbers). The California DMV does not provide a search to see which plates are available. Instead, you can go here to look up California plates for free. Some of these plates require an application form to be considered. To be eligible, you may have to provide additional documentation. For example, if you are applying for the Firefight License Plates, you would have to provide documentation that shows that you are/were a firefighter. Whether you have just moved to California with your car or you are a resident purchasing a new vehicle, you must get your vehicle registered at the DMV within 20 days. Depending on the vehicle you are registering, you may also need additional documents such as an emissions test or previous title. In California, you do not surrender your plates to the DMV when you sell your car. Instead, your plates remain with the car and transfer to the new owner (if there is a new owner). However, if you have purchased specialty plates, those remain yours and you can have them transferred to your new vehicle or simply to hold onto. If you already have standard plates for your vehicle and wish to upgrade to specialty plates, you will have to surrender your standard plates to do so. Sometimes you may find your license plates missing. If this occurs, you must apply for new plates immediately. You can obtain new plates by submitting a application for replacement then bring it in person or mail it to the DMV. To receive your new plates faster (sometimes in the same day) it is best to go to the DMV instead of mailing an application for replacement. Note: you can obtain a replacement for the monthly stickers absolutely free! Before your the date on your license plate stickers expire, you should go to the DMV and renew your vehicle’s registration. You’ll have to renew your vehicle once per year, and upon renewal you will receive a new year sticker to apply to your license plate. Depending on the year your vehicle is made, you may also be expected to undergo an emissions test. Changes to legislation occur each year, and with the advancements in car technologies, your car may be subjected to additional fees if it does not keep the air clean. Before ordering your personalized license plate, you can look up available license plates in California, free. You’ll be able to find which plate names are available. As well, if you are looking to purchase a vehicle privately, this license plate search engine gives you VIN information such as vehicle history and previous owners.